Bit of gig news for you. 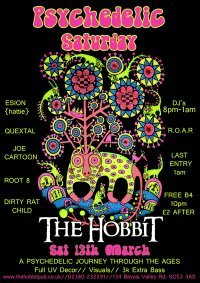 This Saturday you can catch Quextal on another visit to the hallowed halls of The Hobbit in Southampton for Psychedelic Saturday. Not exactly sure what genre(s) I’ll be playing yet, but it’s a fairly safe bet that psybreaks will be in there prominently… nor am I sure what time I’m on, but I advise getting down early anyway because it’s free entry before 10pm! If you’re in the Southampton area get yourselves down to The Hobbit on Saturday 31st January where I’m playing at a night called Psychedelic Saturday. All psy-styles are represented from the 60s to now, but with an emphasis on the more modern and danceable stuff 🙂 I’ll be playing…well…the psy edge of what I normally play, ie psy-breaks, psy-trance, psy-techno, psy-wonk, psy-dnb… you get the picture… should be an awesome party 🙂 Music runs 8pm – 1am, it’s free entry before 10pm, £2 after, and the bar stays open until 3. See you there! Oxjam reminder: Sunday 25th May from 1pm! 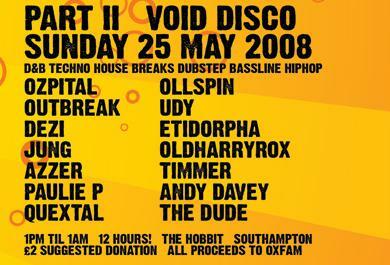 Don’t forget… n e x t w e e k e n d Bank Holiday Sunday 25th May 2008 everyone within a hundred miles of Southampton is instructed to converge on The Hobbit pub in that town at precisely 1pm (don’t be late or you’ll miss my set!) for 12 hours of massive musical mayhem and good times galore. I’ve been given the honour of starting the proceedings, 1-2 in the afternoon. There will be barbecue there with good food, so no need to have lunch before you come down. You should obviously expect to be dancing for the whole of my set 8-), but then you’ll have worked up a proper appetite and you’ll appreciate that nice charred burger all the more. And of course, it’s all for a good cause: Everyone involved in putting on the party is giving their services and equipment for free, so all proceeds and donations go straight to Oxfam to help those whose need is so unimaginably greater than ours. We get a really great party. They get access to fresh water, or a goat, or emergency rations, and the support of an organisation which continues to campaign for a fairer world, for the rights of the world’s poorest people to clean water, sufficient food, shelter, healthcare, knowledge… the essentials of survival that we take for granted. I’ll be playing alongside a baker’s dozen of the other finest southcoast DJs at this event, masterminded by those crazy folk over at Out Of The Void. The date and time for your diary is 1pm to 1am on the Bank Holiday Sunday 25th May, and it’s all for charidee, so even if you don’t care about seeing me play, come along anyway. Last year’s event was several metric shedloads of fun, and this one is shaping up to be even more awesome, if such a thing were possible. EDIT: I’ll be on first (1pm) so I guess I’d better play something of an uplifting and progressive flavour (breaks/house/trance) rather than spooky techno. Probably.